Part 2 of a 7-part series. All parts will be public entries. This entry consists of 19 640x480 pictures. 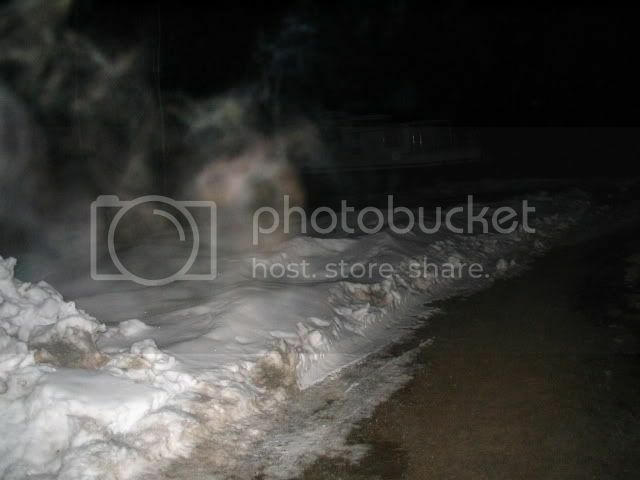 We went to McAfee Cemetery in Fort Erie, supposedly the most haunted cemetery in town. I took a pic of my car right when we got there. You can see from the satellite image that the cemetery is cut in half by Thompson Rd. I took a picture from the western half facing across the road to the eastern half. We traversed the western half first. They had brought snowplows in and drove them over this secton of graves. We were furious. At the back of this half, we noticed an RV, so we went to see it. It was too muddy, so we tuned around and I felt something behind me and took this picture. I squealed and Jaclyn jumped to my side to investigate. She gave me a huge hug and told me what a lucky and amazing shot that was. Dave was impressed. We walkd back out towards the car. I stood on the road and took this one. Dave wanted to go behind the eastern part to where there used to be a derelict and condemned house. The snow was too deep for us. A shot back into the cemetery. And back to my car to head to Waverly Beach.